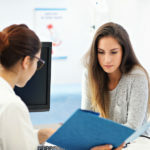 Top 10 questions to ask at your doctor’s appointments, so you are not left feeling overwhelmed. If you are anything like me, once I step foot into the doctor’s office every question I had goes right out the window as well as forgetting important health information or dates that could be useful. By the time I get back to the car, my head is spinning and I am left with a ton of unanswered questions. Learning to be prepared can help with those feeling, so here are some useful tips that I wanted to share with you lovely ladies. – Important family history that your provider should be aware of. Asking the right questions can help you get the answers you need. 1: What is my diagnosis? You want to have the official name of your diagnosis. This is helpful so that you can provide this information to other members of your healthcare team, as well as find specialist or support group that you may feel are needed. I have found it helpful to write it down. 2: What are my treatment options? You want to know what the benefits and side effects are for each treatment option. 3: Are there any other test that I will need to complete? You will want to know why the test is important, what the results will tell and if there is any special preparation for the test. 4: What medications are being prescribed? If your doctor is prescribing a medication it is important to write down the name, dosage and frequency. Also ask if there are any side effects or what you can expect from the medication. .
5: Are there any daily lifestyle changes that could help? Such as exercising, nutrition, stress management, etc. Things that should be done or should not be done. 6: Why I need surgery? What are the benefits of surgery? What will happen if surgery is not done? How is the surgery performed? What is the downtime after surgery? 7: What are some alternative treatments that may help? 8: What are options for managing pain? Medication? Supplements? Lifestyle changes? 9: What happens if you decide to do nothing? 10: Make sure to communicate clearly with your doctor about your symptoms, the effect it has on your daily living, any concerns you may have. It is important that your doctor listens and does not dismiss your symptoms. If you feel as though your provider has dismissed any of your concerns, it is time to make a change. Remember your healthcare provider should be a part of your team, but you are the leader of your wellness. Have helpful tips that you would like to share with the rest of the community, please feel free to drop us a line. It is important to have a community of women supporting each, so we are never felt alone. To learn more about my own journey and how becoming a Women’s Health Coach changed my life click here.